TAMPA, Fla., November 25, 2013 – Thermablok, an aerogel insulation product derived from NASA’s aerogel technology is included as a NASA technology spinoff product in the popular Space Shuttle Enterprise exhibit at the Intrepid Sea, Air & Space Museum in New York City. Aerogel, considered the highest insulating material known and one of the lightest solids, was successfully used by NASA for insulation purposes on the space shuttle, Mars Pathfinder and other rovers, and STARDUST spacecraft missions to combat extreme temperature environments. NASA first recognized Thermablok as a technology spinoff in the space agency’s publication titled “Spinoff” which features innovative products whose development can be linked to NASA. In a standard metal stud wall, adding just ¼ X ½ inch Thermablok aerogel strip to just one edge of each stud before putting the drywall on can result in an amazing 42 percent increase in the overall R-value of the wall (DOE Oak Ridge laboratory test results). Thermablok is owned by Tampa entrepreneur Lahnie Johnson, who is also the president and founder of Acoustiblok Inc., a leading Tampa based soundproofing manufacturer and seller. Johnson, a veteran of the aerospace industry himself, also owns several other innovative businesses. Spin-off technologies are offspring commercialized products that have direct roots from NASA funding, research, licensing, facilities, or assistance. While NASA does not manufacture, market or sell commercial products, many commercial products are derived and have been adapted by private industry from NASA technology. Such is this revolutionary composite aerogel material that is at the core of Thermablok. In buildings or houses, most heat transmission through walls is passed directly through the building envelope, be it masonry, block or stud frame to the internal fascia such as drywall. This process is known as “thermal bridging.” Thermablok eliminates such thermal bridging. Thermablok works by breaking this thermal bridging link while being totally breathable, ensuring a healthy, durable working building with a natural ability to repel liquid while allowing the passage and release of moisture vapor. The ¼ inch thick Thermablok aerogel is available in blanket form on roles or 1.5 X .25 X 54-inch adhesive backed strips. As the metal studs in a wall allows the majority of thermal bridging, Thermablok strips are typically installed on the edge of each stud (one side only), before the drywall is installed. Besides increasing the “R” values of the wall by over 40 percent (regardless of insulation used in the wall), this allows for fast, easy installation without affecting standard construction. There are of course a myriad of other thermal bridging points in a structure that Thermablok can interrupt thermal bridging in. Improved energy efficiency achieved with Thermablok Aerogel will provide continuing energy cost and environmental savings. As an example, adding Thermablok Aerogel to a 787 square-feet residential home with 16 inches on center framing, R13 cavity insulation, and wood siding should result in a $783 dollar annual energy cost savings and eliminate 3.9 tons of CO2 emissions. In order to better understand how and why Thermablok is so effective, it’s important to first understand aerogels. Resembling a hologram, it’s deceiving whether aerogels are really there or not. Aerogel is a synthetic porous ultralight material derived from a gel, in which the liquid component of the gel has been replaced with a gas. The result is a solid with extremely low density and low thermal conductivity. Aerogel is a diverse class of ultralow density solids that combine multiple disparate and extreme materials properties into a single material envelope. Discovered in 1931, the original aerogel was silica based. These are often referred to as classic or legacy aerogels, or just “aerogel.” Mixed with silicon dioxide and solvent, aerogel is 99.8 percent air, and is 1,000 times less dense than glass. Despite weighing only 3 milligrams per cubic centimeter, aerogel can support up to “4,000” times its own weight if the force is gently and uniformly applied. Aerogel can also withstand high temperatures, so much so that placing crayons on top of the aerogel are protected from a flame underneath and will not melt. Some types of aerogel, including composite aerogel, provide 39 times more insulation than fiberglass. In terms of aerogel’s physical appearance, aerogels are sometimes referred to as “frozen smoke,” “solid smoke,” “solid air” or “blue smoke” because of the material’s translucent nature and the way light scatters in it. The substance has been described as feeling like volcanic glass pumice; a very fine, dry sponge; and extremely lightweight polystyrene (Styrofoam). When you hold a piece of silica aerogel, it feels otherworldly. The remarkable characteristics of silica aerogel—low density, light weight, and unmatched insulating capability—attracted NASA for cryogenic insulation for space shuttle and space exploration mission applications. “Many people in the building industry and homeowners are unaware of aerogel technology and benefits over standard fiberglass insulation. We’ve been trying to tell people about our product for the past few years. Changing consumer habits and making them knowledgeable on new products is difficult, time-consuming and expensive,” said Johnson. 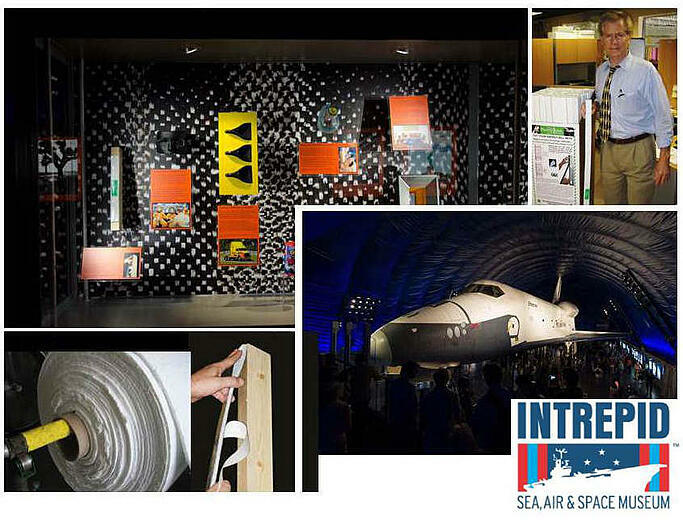 “I’m very proud to have Thermablok included in the Space Shuttle Enterprise exhibit at the Intrepid Sea, Air, & Space Museum. It’s great for people to see how entrepreneurs can take a technology and innovate it into something that can help people have a better quality of life,“ Johnson concluded. The Intrepid Sea, Air & Space Museum is home to the Space Shuttle Pavilion, which features Enterprise, NASA’s first space shuttle that paved the way for America’s successful Space Shuttle Program. Opened in 1982, the Intrepid Museum is the only museum where visitors can explore a legendary aircraft carrier, the first space shuttle, the world’s fastest jets and a guided missile submarine. About Thermablok and Acoustiblok Inc.
Acoustiblok Inc., a NASA Spin-off listed company headquartered in Tampa, FL, provides acoustical soundproofing solutions for noise related issues. The company develops, manufactures, and markets acoustical products around the world, earning the industry’s highest ratings from architects, builders, and consumers. Primary products include Acoustiblok® viscoelastic polymer based soundproofing material, Acoustifence® outdoor noise barrier, All Weather Sound Panels®, QuietFiber® insulating material, Quiet-Cloud® industrial sound absorption panels, Acoustiblok WALLCOVER®, and Thermablok® aerogel nanotechnology insulation. Acoustiblok products are used in industrial, residential, commercial, and marine sectors worldwide. The company’s products are made and sourced in the United States. The Intrepid Sea, Air & Space Museum is a non-profit, educational institution featuring the legendary aircraft carrier Intrepid, the space shuttle Enterprise, the world’s fastest jets and a guided missile submarine. Through exhibitions, educational programming and the foremost collection of technologically groundbreaking aircraft and vessels, visitors of all ages and abilities are taken on an interactive journey through history to learn about American innovation and bravery. The Intrepid Museum fulfills its mission to honor our heroes, educate the public and inspire our youth by connecting them to history through hands-on exploration while bridging the future by inspiring innovation. Connect with us on Facebook, Twitter and YouTube. Contractors installed 21,000 linear feet of Thermablok aerogel insulating strips as an eco-friendly measure to prevent thermal bridging at the newly constructed Fabens U.S. Border Patrol Station in Clint, Texas. CLINT, Texas, February 1, 2012 — Crews working construction on the environmentally sustainable Fabens U.S. Border Patrol Station in Clint, Texas have just completed installing 21,000 linear feet of Thermablok® aerogel insulating strips on studs throughout the 51,000 square foot facility. Incorporating NASA aerogel technology, Thermablok reduces thermal bridging (heat transfer) – the prime cause of energy loss in buildings. When RVK Architects of San Antonio collaborated with Jacobs Engineering Group of Houston to design the eco-friendly structure already years in the planning, they included Thermablok in the original design. Thermablok consultant Marilyn Myers of Acoustiblok, Inc. advised Marco Barrio, architectural QC/BIM specialist for the project’s General Contractor, SpawGlass, on the product. Barrios said the strips went up easily since they have peel and stick adhesive already attached to the back of the product. The facility is fitted with solar heaters, sky lights, glazed windows, and energy efficient equipment for a low carbon footprint. 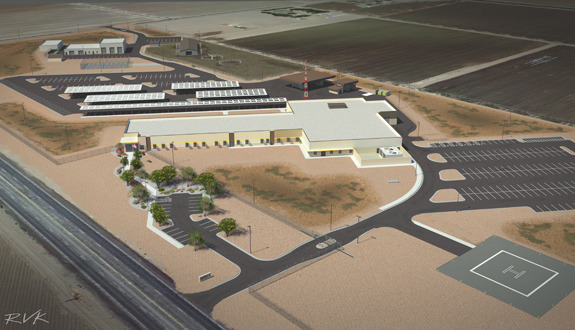 The compound consists of five structures that include a 50,585-square-foot patrol station with administrative offices, holding/detention spaces, and training rooms; a 9,834 square foot maintenance building with storage; fueling stations; vehicle washing station; and canine shelter and horse corral. The site, scheduled for completion in June, 2012 will include controlled access, staff and visitor parking, an impound lot and helicopter landing pad. Construction at the site, about 30 miles southeast of El Paso along the Rio Grande, began in April 2011, seven months after SpawGlass was awarded the contract in September 2010. “It’s exciting to see Thermablok used in such an environmentally sensitive area,” said Lahnie Johnson, president of Acoustiblok, Inc. in Tampa, Florida. Acoustiblok is the parent company of Thermablok. “Thermal bridging is the number one cause of wasted energy from buildings, and this is the perfect application for Thermablok, in the dessert climate of South Texas. We are providing an environmentally sound answer to thermal bridging using aerogel technology – the highest insulating material known to exist. SpawGlass is a Houston-based general contractor, construction manager, design/builder and civil contractor with expertise in Building Information Modeling (BIM) and green building, serving clients in corporate, higher education, healthcare, government/public, senior/campus living and more. The Fabens Station’s area of responsibility encompasses 24 miles of International Boundary. The continuous 24 miles of rough desert and Rio Grande terrain are a hotbed for illegal trafficking of aliens and drugs. The primary duty of the Fabens border patrol agents is linewatch operations. Made in the USA, aerogel-based Thermablok is 100 percent recyclable, impervious to moisture and mold, and unaffected by age. Green, energy-conscious architects and builders are currently incorporating this new NASA aerogel technology into energy conservation and CO2 emissions reduction. Just one, 1/4-inch x 1½-inch (10mm x 38mm) strip of Thermablok aerogel insulation applied to the edge of each stud before hanging drywall breaks the conductive “thermal bridging” and can increase the overall wall R-factor by more than 40 percent (US Department of Energy/JM Laboratories). NASA named Thermablok aerogel insulating material to its prestigious “Spinoff” list of companies that have successfully adapted NASA technology to everyday products and made them available to consumers. Thermablok is most often used in construction as a preventative measure against thermal bridging. For more information, visit the Thermablok website, email sales@acoustiblok.com, or call 813-980-1400. 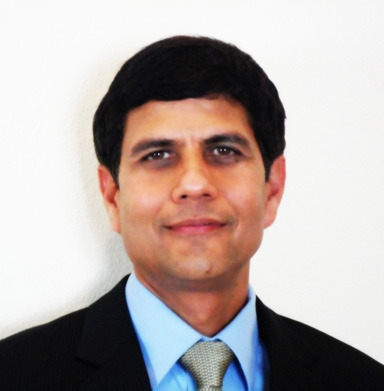 TAMPA, Florida, October 24, 2011 – Vinod Sharma has been named Acoustiblok Executive Vice President of Business Development for India and the contiguous region. Sharma, who signed on as Director of Engineering for the Tampa-based sound abatement and thermal insulation company in March, will be responsible for expansion and growth of Acoustiblok, Inc. and Thermablok, Inc. in South Asia. He will report directly to CEO and President Lahnie Johnson. Sharma, a native of Jaipur, India, moved to Tampa from Brunei in 1998. He brings more than 15 years’ experience in consulting, design engineering and project management for industrial, governmental and public agencies in the U.S., India and Brunei. Sharma earned a bachelor’s degree in Mechanical Engineering from the National Institute of Technology (NIT) in Jaipur, India. Acoustiblok’s high quality noise abatement products, available since 1998, have earned the industry’s highest ratings from architects, builders and consumers. Acoustiblok is a proprietary viscoelastic polymer material with a high density mineral content, heavy and yet extremely flexible. As sound waves cause the Acoustiblok material to flex, internal friction occurs and the acoustical energy is dissipated into undetectable trace amounts of heat. Just one, 1/8- inch layer of Acoustiblok in a standard wall will result in more sound reduction than 12-inches of poured concrete. Environmentally friendly, Acoustiblok contains no lead or asbestos, is UV resistant and impervious to water and mold; it is UL rated and classified for virtually all wall, floor and ceiling installations. Available internationally, Acoustiblok was awarded first place in England’s Sound Abatement Competition, presented at the British House of Commons. Thermablok received international attention for its role in the prestigious 2009 Solar Decathlon competition, in which the energy-conserving house built by architectural students at California College of the Arts (CCA) and Santa Clara University (SCU) won first place in the Architecture division with its state-of-the-art Refract House. Thermablok was featured in the Refract House, chosen for inclusion because of its incomparable insulating properties, the highest inexistence. Made in the USA, Thermablok is 100-percent recyclable, impervious to moisture and mold, and unaffected by age. Green, energy-conscious architects are currently incorporating this latest answer to energy conservation and reducing CO2 emissions. Just one, 3/8-inch x 1½-inch (10mm x 38mm) strip of Thermablok aerogel insulation added to only the edge of each stud before hanging drywall breaks the conductive “thermal bridging” and can increase the overall wall R-factor by more than 40-percent (US Department of Energy/JM Laboratories). NASA named Thermablok aerogel insulating material to its prestigious “Spinoff” list of companies that have successfully adapted NASA technology to everyday products and made them available to consumers. Thermablok is most often used in construction as a preventative measure against thermal bridging. It was most recently used by Rice University student to insulate a portable solar autoclave, providing health practitioners the ability to sterilize medical instruments in Haiti and other impoverished regions worldwide where electricity is unavailable. Acoustiblok and Thermablok are 100-percent made in the U.S.A. For more information, visit email vsharma@acoustiblok.com, call 813-980-1400 x 205, or visit the website at www.acoustiblok.com. A 60-year-old Spartan trailer, originally purchased as a future home for a Hurricane Katrina evacuee, was insulated with a gift of Thermablok strips. Installing the aerogel-based Thermablok is the first step of the CalArts NOMAD LAB project’s plan to use the trailer’s renovation to teach inner-city youths about sustainable “green” building materials and architectural principles. SANTA CLARITA, California, August 22, 2011 – Acoustiblok, Inc. has donated its NASA technology Thermablok® aerogel insulating strips for installation in a 1951 Spartan trailer which is being renovated and used to sponsor a youth architecture program in the blighted Valle del Oro neighborhood of Santa Clarita. The “Trailer Trash” project, now part of the ever-growing California Institute of the Arts’ NOMAD LAB, is the brainchild of Sam Breen, who purchased the run-down, 30-foot trailer to refurbish as a home for his Mother Lydia, a displaced Hurricane Katrina evacuee. In October, 2010, Breen - then a 27-year-old graduate student at CalArts – sought permission to park the trailer on the school’s Valencia, California campus while he began gutting and preparing it for restoration. The trailer earned instant celebrity as Breen and other students utilized the Spartan as an on- and off-campus mobile performance space, make-shift classroom, and screening room used to explore how displacement and artistry go hand-in-hand. 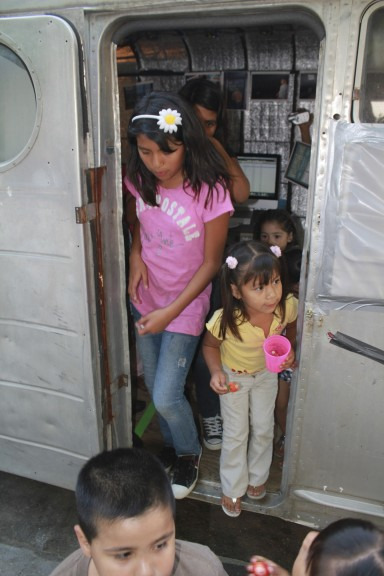 Evelyn Serrano, a member of CalArt’s faculty, saw the potential for Breen’s trailer to be used in the NOMAD LAB, a program based in the nearby crime-riddled Valle del Oro neighborhood of Santa Clarita, which brings the Arts and other programs and activities to youths and families living in the gang- and crime-infested community. Breen brings the trailer to the Valle del Oro community periodically to be used as part of the NOMAD LAB’s architectural workshop. “The youths have been learning about basic architecture principles, and as part of the architecture process they investigate the meaning of ‘home’ and ‘community’ in a neighborhood that is challenged by rising gang violence and drug trade,” Serrano said. The trailer also serves as an exhibition and screening space for the youths’ films and artwork. The next step is to lead workshops on “green” architecture and home building topics, including insulation, for the community’s young people. In August, Breen installed the Thermablok aerogel insulation strips to the gutted Spartan as the first part of the “Trailer Trash” project’s thorough refurbishment using safe, clean, and renewable materials. Valle del Oro youths will learn about green insulating materials in the process, as they participate in the trailer’s renovation. “It is always a privilege to be a part of a program that helps young people learn more about sustainable building materials like Thermablok,” said Lahnie Johnson, founder and president of Thermablok and its parent company, Acoustiblok, Inc.
Acoustiblok, Inc., Thermablok’s parent company, received international attention for Thermablok’s role in the prestigious 2009 Solar Decathlon competition, in which the energy-conserving house built by architectural students at California College of the Arts (CCA) and Santa Clara University (SCU) won first place in the Architecture division with its state-of-the-art Refract House. Thermablok was featured in the Refract House, chosen for inclusion because of its incomparable insulating properties, the highest in existence. product manufacturing 100-percent made in the U.S.A. resources on environmentally important projects for the worldwide community. For more information, visit the website, email sales@acoustiblok.com, or call 813-980-1400. Thermablok’s NASA technology aerogel is being used to insulate the Capteur Soleil solar autoclave, addressing a long-standing health issue in developing countries. By incorporating Thermablok’s aerogel insulating technology, the autoclave may now be used to sterilize medical instruments in developing countries where sterilizing medical equipment has previously been impossible in regions with no electricity. HOUSTON, Texas, May 11, 2011 – Combining the unrivaled insulating properties of aerogel technology and a decades-old device created by French inventor Jean Boubour, Rice University engineering students are harnessing the sun’s energy to power an autoclave that can be used in developing countries, where electricity is rare or non-existent, to sterilize medical instruments and help solve a long-standing health problem. Engineering students incorporated a thin layer of Thermablok aerogel insulation in the autoclave’s plywood frame to provide the thermal protection necessary in any climate and terrain. Thermablok’s aerogel has the highest insulating properties of any material known to man. This technology was developed in conjunction with NASA’s application of aerogel use in shuttle and mars missions. For this reason, Thermablok was the perfect insulator for the project, according to Sam Major, Rice University senior engineering student. The students used Capteur Soleil, a device created decades ago by French inventor Jean Boubour to capture the energy of the sun in places where electricity, or fuel of any kind, is hard to get or nonexistent. By attaching the Thermablok-insulated box containing the autoclave, the students transform the device into a potential lifesaver. The Capteur Soleil, which sits outside Rice's Oshman Engineering Design Kitchen, looks something like an ultramodern lawn swing. Its spine is a steel A-frame, and a bed of curved mirrors beneath the frame produces steam by focusing sunlight along a steel tube at the frame's apex. Rather than pump steam directly into the autoclave, the Rice team chose to use the steam to heat a custom-designed conductive hotplate. "It basically becomes a stovetop, and you can heat anything you need to," said Major. "As long as the autoclave reaches 121 Celsius for 30 minutes (the standard set by the Centers for Disease Control and Prevention), everything should be sterile, and we've found we're able to do that pretty easily." He said one person could easily adjust the Capteur Soleil by ratcheting up the back leg to align the mirrors with the sun. Within half an hour of receiving strong sunlight, the Capteur Soleil will begin to produce steam, which will in turn heat the patterned hotplate and then the standard-issue, FDA-approved autoclave. With good midday sun, Major said, it takes 40 minutes to an hour to begin significant heating of the autoclave. The autoclave, which has a steamer basket inside, holds about an inch of water inside, followed by the basket with the tools and syringes to be sterilized. "We've used some biological spores from a test kit, steamed them, and then incubated them for 24 hours and they came back negative for biological growth,” Major said. "This is really the latest iteration of a much larger project," said Doug Schuler, the team's faculty adviser and an associate professor of business and public policy at Rice's Jones Graduate School of Business. 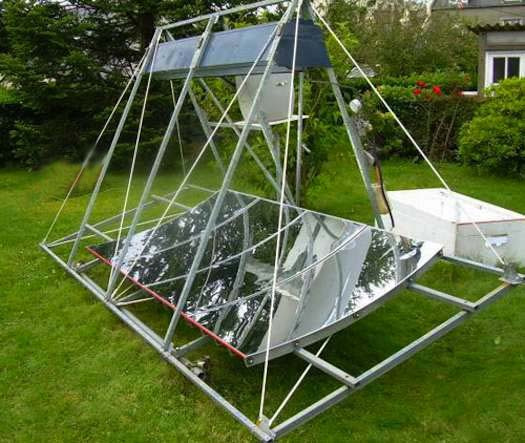 "We already have a version of the Capteur Soleil being used in Haiti for cooking, but we felt it could do more." NASA named Thermablok aerogel insulating material to its “Spinoff” list of companies that have successfully adapted NASA technology to everyday products and made them available to consumers. Thermablok is most often used in construction as a preventative measure against thermal bridging. The thermal R-value of a stud wall is increased by more than 40-percent with just one thin strip of Thermablok on each stud before drywalling. Thermablok and its parent company Acoustiblok, Inc., is proud to focus its research and product manufacturing resources on environmentally important projects for the worldwide community For more information, contact us at sales@thermablok.com, or visit our website at www.thermablok.com.